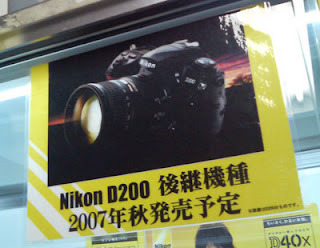 There are rumours flying like mad, beginning with this photo of a poster in a camera shop in Tokyo advertising the sale of a D200 replacement in the fall. Originally from the following post on dpreview. There is also the fact that Nikon is sponsoring the IAAF World Championships in Athletics Osaka. It would make sense for Nikon to announce a new pro camera at the same event they're sponsoring. Flickr discussion on the subject.